Residence of successful Spanish banker Fernando Rioja was built in 1907, and has been designed by prestigious French architect Alfredo Azancot, the author of numerous buildings in Viña and Valparaiso, inspired by a refined French classicism. Palacio Rioja is a part of a complex that includes, among other facilities, swimming pools, tennis courts, stables and private theater, and a large park dedecorated with palm trees. 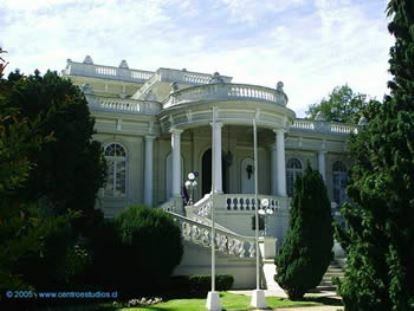 Today it works as a cultural center and museum, place for receptions and official activities.